Halo semua, masih semangat belajar bahasa Inggris? Untuk menambah semangat kalian mempelajarinya, kali ini saya kembali mensharingkan beberapa kisah menarik dalam bahasa Inggris. Cerita pendek ini melanjutkan seri cerita berbahasa Inggris sebelumnya. Kali ini ada 10 cerita lagi yang akan mengasah reading skill kita lebih jauh lagi. Bukan hanya itu, kita juga semakin banyak menemukan kata-kata baru yang menambah vocabulary kita. Tema cerita yang unik atau terkadang nyeleneh cukup bisa menghibur. Silahkan menyimak cerita-cerita jenakanya Nasreddin dan kawan-kawan. One day Nasreddin’s donkey was ill, so he borrowed a horse from an officer. It was a big, strong animal, and usually nobody rode it except the officer. It tried to throw Nareddin off, but he stayed on it. Then it suddenly began to run away with him. He tried to turn it towards his house, and he tried to stop it, but it continued to run the opposite way. 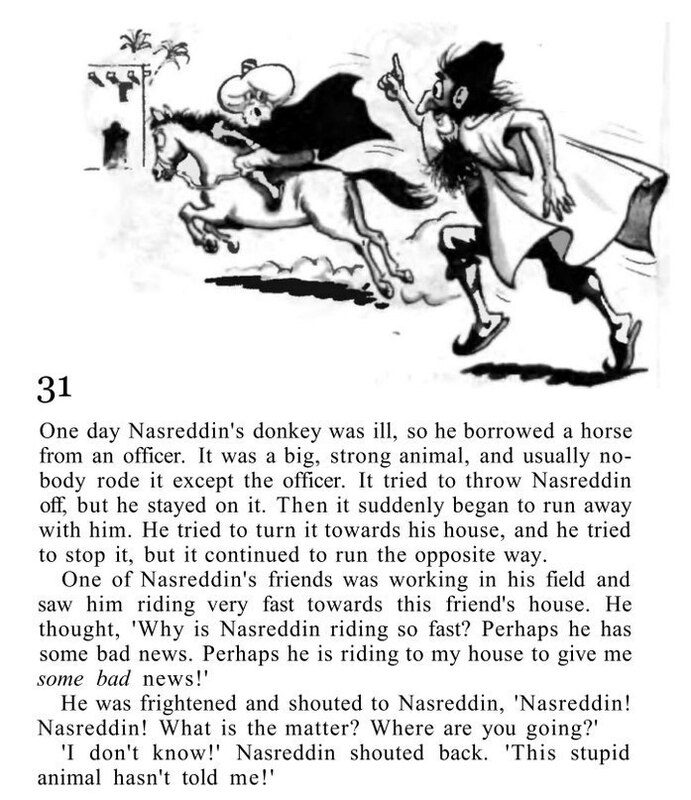 One of Nasreddin’s friends was working in his field and saw him riding very fast towards this friend’s house. 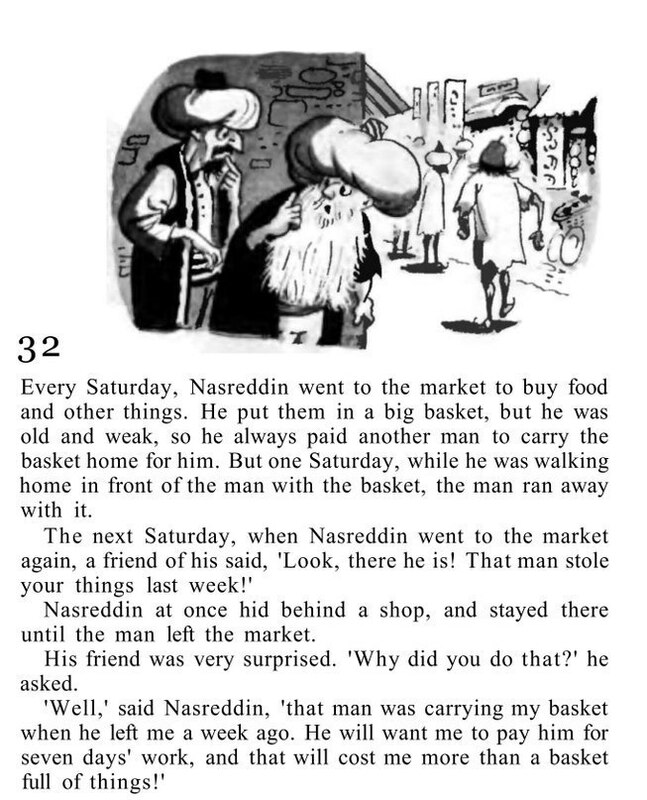 Every Saturday, Nasreddin went to the market to buy food and other things. He put them in a big basket, but he was old and weak, so he always paid another man to carry the basket home for him. But one Saturday, while he was walking home in front of the man with the basket, them man ran away with it. Nasreddin at once hid behind a shop, and stayed there until the man left the market. His friend was very surprised. ‘Why did you do that?’ he asked. 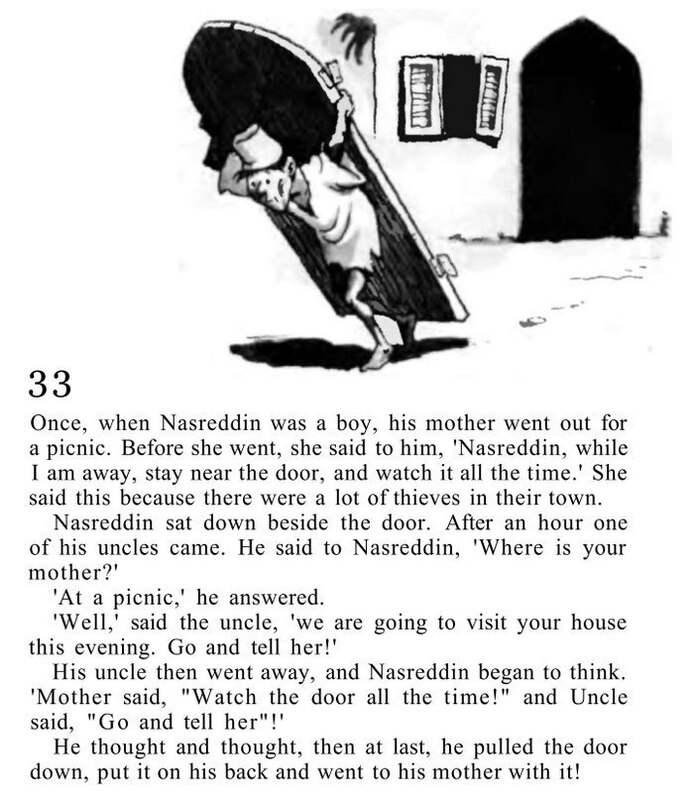 Once, when Nasreddin was a boy, his mother went out for a picnic. She said this because there were a lot of thieves in their town. Nasreddin sat down beside the door. After an hour one of his uncles came. ‘At a picnic’, he answered. He thought and thought, then at last, he pulled the door down, put it on his back and went to his mother with it! 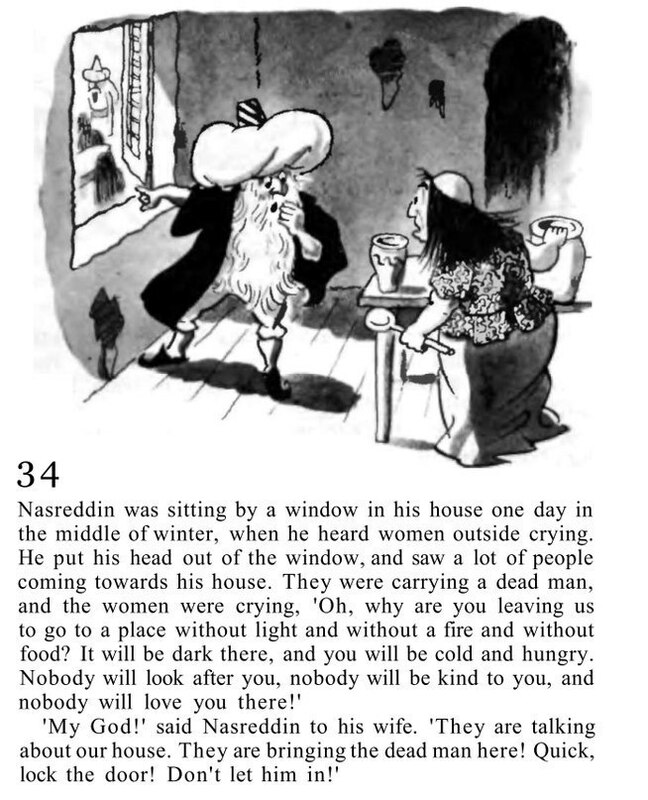 Nasreddin was sitting by a window in his house one day in the middle of winter, when he heard women outside crying. He put his head out of the window, and saw a lot of people coming towards his house. ‘My God!’ said Nasreddin to his wife. ‘They are talking about our house. 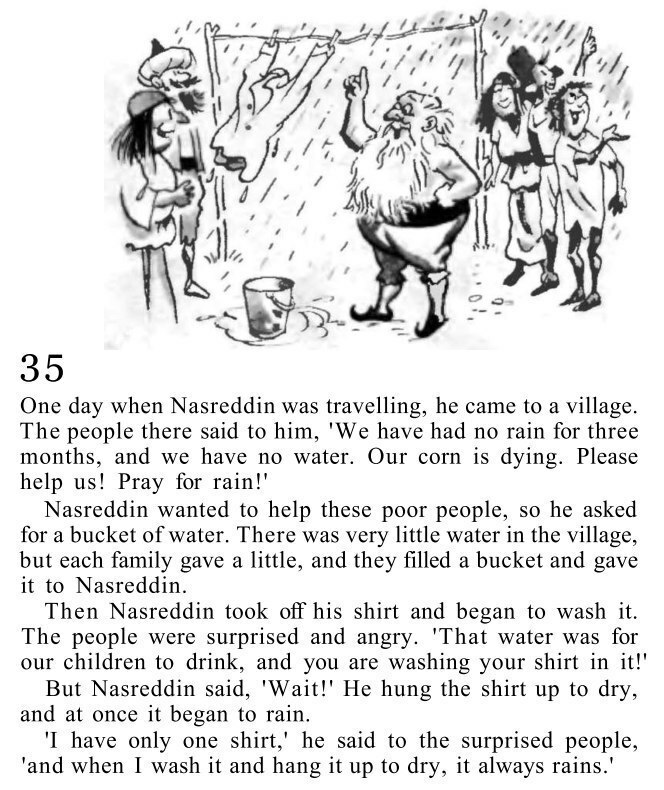 Nasreddin wanted to help these poor people, so he asked for a bucket of water. There was very little water in the village, but each family gave a little, and they filled a bucket and gave it to Nasreddin. But Nasreddin said, ‘Wait!’ He hung the shirt up to dry, and at once it began to rain. ‘I have only one shirt,’ he said to the surprised people, ‘and when I wash it and hang it up to dry, it always rains. Three people were walking along a street, first a big man then a pretty woman, and then an old gentleman. The first two went round a corner. Suddenly the gentleman saw a piece of paper on the ground. He picked it up. It was five pounds. A few seconds later, the young woman came back. She was crying. ‘I have dropped five pounds,’ she said. The young woman thanked him and went away. After a few seconds, the big man came back. The big man was very angry. 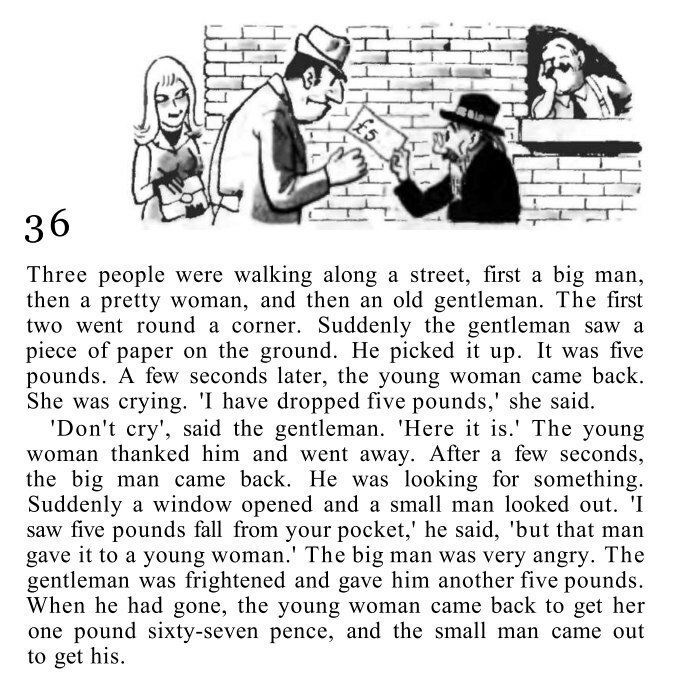 The gentleman was frightened and gave him another five pounds. When he had gone, the young woman came back to get her one sixty-seven pence, and the small man came out to get his. Nasreddin liked fish very much, and when he had enough money, he bought some for his dinner when he went to the market, and took it home. 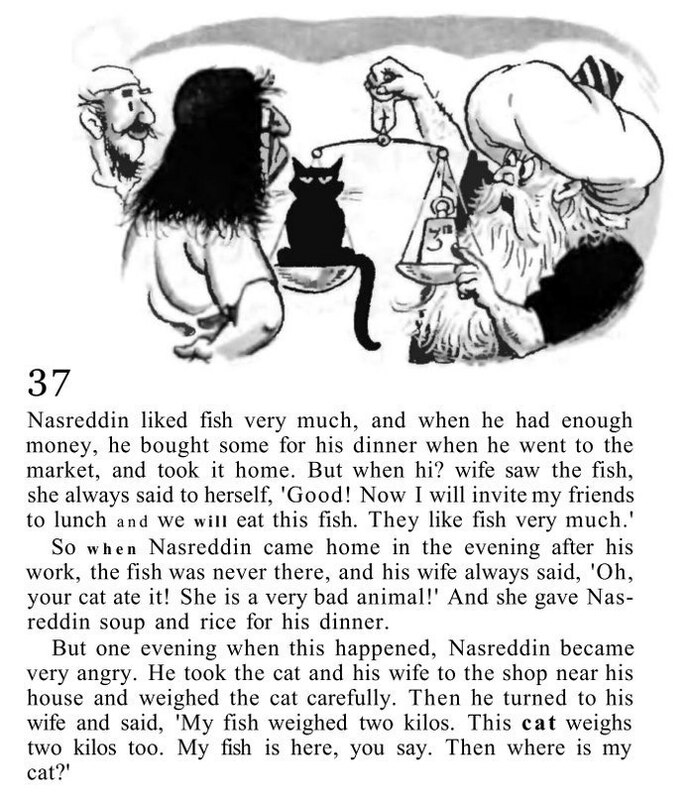 And she gave Nasreddin soup and rice for his dinner. But one evening when this happened, Nasreddin became very angry. He took the cat and his wife to the shop near his housee and weihed the cat carefully. Then he turned to his wife and said, ‘My fish weighed two kilos. This cat weighs two kilos too. One day when Nasreddin was having a bath, he began to sing. The bathroom was small and had a stone floor, so his song was very beautiful, he thought. 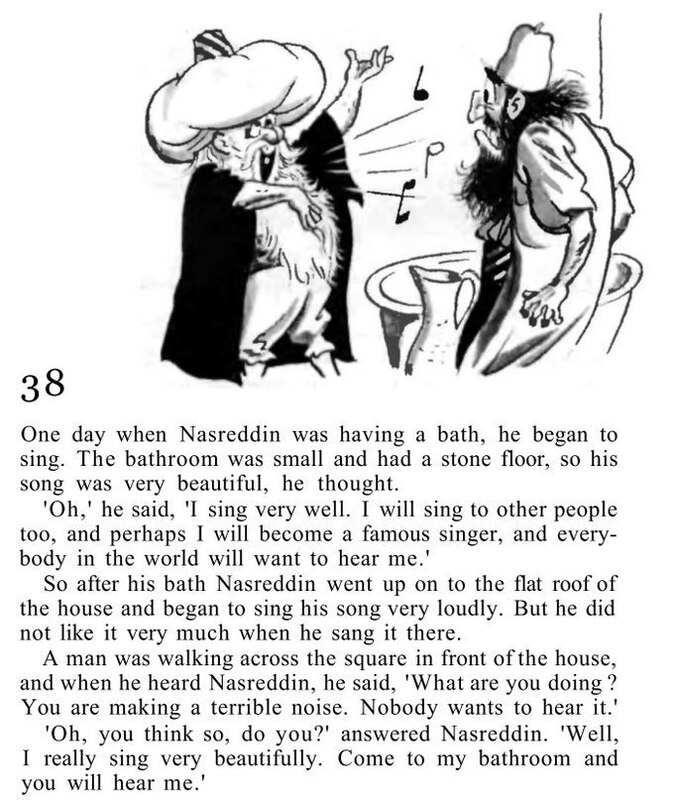 So after his bath Nasreddin went up on to the flat roof of the house and began to sing his song very loudly. But he did not like it very much when he sang it there. ‘Oh, you think so, do you?’ answered Nasreddin. ‘Well, I really sing very beautifully. The police in the big city were looking for a thief. At last they caught him. But while they were taking photographs of him-from the front, from the left, from the right, with a hat, without a hat – he suddenly attacked the policemen and ran off. They tried to catch him, but he got away. Waterbridge was a small town 150 kilometres from the city. 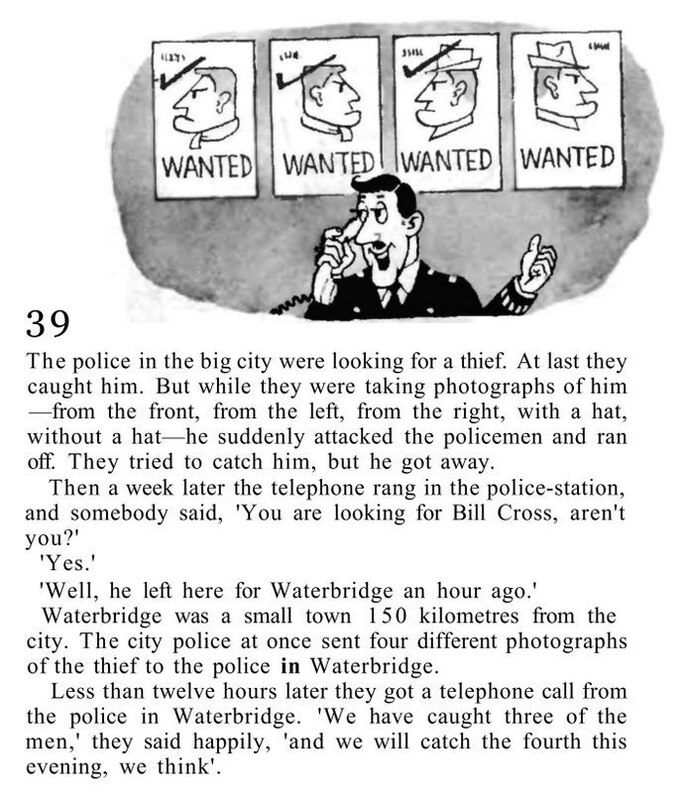 The city police at once sent four different photographs of the thief to the police in Waterbridge. Less than twelve hours later they got a telephone call from from the police in Waterbridge. ‘We have caught three of the men,’ they said happily, ‘and we will catch the fourth this evening, we think’. Mrs Jones was still cleaning the house when her husband came back from work. She was wearing dirty, old clothes and no stockings, her hair was not tidy, she had dust on her face, and she looked dirty and tired. Mrs jones’s neighbour, Mrs Smith, was there. When she heard Mr Jones’s words, she quickly said goodbye and ran back to her carefully, put on her best dress and her prettiest stockings, painted her face, and waited for her husband to come home. semoga cerita-cerita di atas bisa terus meningkatkan kemampuan kita dalam belajar bahasa Inggris. Sampai jumpa lagi pada pertemuan saya yang lain.